Production of furniture is a very responsible task. The furniture is not simply beautiful interior. It is, first of all, reflection of the host. And each owner wants to create most enjoyable and comfortable atmosphere for all guests. What else can help with it other than furniture? JSC MOLODECHNOMEBEL puts needs of clients at the first place where manufacturing process is geared to final customer and each furniture set is a piece of art. So, you want to choose the great custom furniture manufacturer with years of traditions, modern technology, high quality standards? Well, then you have arrived at the right place, JSC MOLODECHNOMEBEL is your choice. We have almost 60-year history of successful activity in manufacturing of furniture, which is supported by clientelle in Europe, US, Belarus, Russia and other countries. So here is a bit of our story. Let’s begin with history. We are nearly 60 years old, and, probably, it is not too much. However during this time the MOLODECHNOMEBEL company managed to combine 2 furniture factories (Molodechnensky and Vileysky), by having synthesized thereby positive experience in furniture manufacturing of the highest class. Production of upholstered furniture under the brand «MOLODECHNOMEBEL» is considered to be custom high end furniture manufacturing long ago. Numerous diplomas and certificates earned at Exhibitions certify the top quality standards and appealing design principles. JSC MOLODECHNOMEBEL is famous for using only environmentally friendly materials in furniture manufacturing. We skillfully use this natural resources of Belarus, only emphasizing charming beauty of natural wood drawing. For furniture manufacturing we use the most modern equipment and the technologies checked in practice, aspiring to reach perfection. Since 2004 at the JSC MOLODECHNOMEBEL enterprise the system of the international quality management of furniture production in Belarus have been implemented, which corresponds to requirements of MS of ISO of a series 9000, the version of 2000. In «MOLODECHNOMEBEL» furniture catalog you can always find furniture, which will suit to the interior of your house. Furniture manufactured by our company includes more than 500 models and modifications. We are involved in production of both soft, and cabinet furniture. You will find sleeping sets of your dreams, furniture for kitchens, living rooms and hallways. Besides, we offer custom made furniture by special orders, which helps clients to design furniture they love and produce it on professional modern equipment. 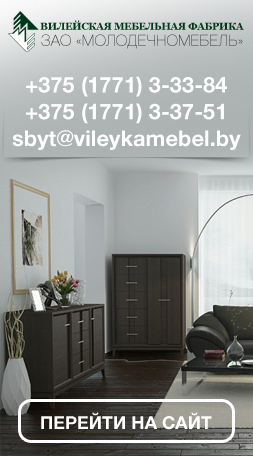 You can acquire furniture of the MOLODECHNOMEBEL brand in Minsk, Grodno, Vitebsk and other cities of Belarus. Manufacturing of our furniture found the admirers locally and abroad – Russia, CIS countries and other countries. Many customers buy our furniture with pleasure for its invaluable qualities and reasonable price, which is strategic policy carried out by JSC MOLODECHNOMEBEL.